It’s a minority of Americans, 37%, but this is still a plurality compared to those who say we spend too much, or “the right” amount. And the number has been a fairly steep climb for the past two years or so. SIPRI lists total world military spending as $1.77 trillion, so the US share in that case would be about 35%. Not bad for a nation with less than 5% of the world population. Do Gallup polls matter? Do these people vote? Does it have any bearing on eventual spending? Who knows . . . I always enjoy reading about ancient remains; last week we were given details about Kennewick Man from Smithsonian magazine. 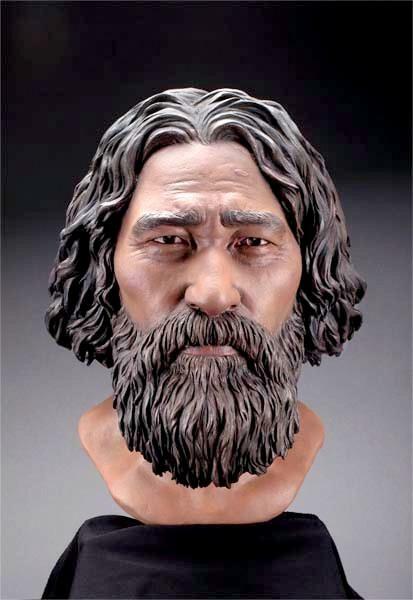 He was a traveler who died about 9,000 years ago in what is now southern Washington state. I enjoy reading these stories, but they can be depressing because they demonstrate that people’s lives back then were indeed often nasty, brutish, and short. Otzi the Iceman from northern Italy is a fine example. When he was first found, I remember that no one knew the cause of death. I read conjectures that he died of a heart attack, fell face down in the snow, and then a bird came and pecked his head. Not a very glorious or solemn end, but hey, there are worse ways to go. THEN it turned out that he had an arrow lodged in his back . . . so he was likely shot from behind, and then he fell down into the snow and after he was dead a bird came and pecked his head. THEN it was discovered that he was covered with the blood of two or three other people, and he had a skull fracture, plus defensive wounds on his hands, plus the arrow in the back. Jeez, the bird pecking a hole in his scalp was an improvement for this guy compared to what he’d been through. Who cares? 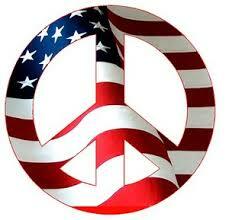 Why mention this on a peace blog? Because, for me, it seems more unlikely we will ever live in a peaceful world if humans seem hardwired for violence — and so many old skeletons we find do indeed betray spectacular violence. I feel like just throwing in the towel when I read about how hard humans have tried to destroy one another for so long. And Kennewick Man’s contribution to this? Well, scientists don’t know what killed him, but they do know that he had two small skull fractures, which he survived; and six broken ribs, which he also survived and which never healed properly; and he also had a spear tip lodged in his pelvis. Furthermore, the Smithsonian article states that about half of ancient skulls in America have fractures similar to his. The most likely explanation is that people threw a lot of rocks at each other. Half of ancient American skulls. So this is the raw material we are working with, from which we hope to come up with a peaceful society. Maybe we should just be encouraged that we have lowered the incidence of skull fractures and spearing so drastically. Perhaps we are more than halfway home. This is a column from Mike Royko from early 1991. Royko was a newspaper columnist in Chicago. Several “best of” collections of his essays have been published, but I don’t know if this one is in any of them. I’ve saved a clipping of it all these years. Scarlett Johansson has a new film, and several publicity stills from the film show her holding guns. Um, you know what, Hollywood? Scarlett is one actor we will watch, at least half of us, even if she is not holding a gun. These are difficult months for a peace blogger. I read this and thought to myself: Holy cow, we may have a peaceful transfer of power, here. What a nice break from what we’ve seen in Egypt, Syria, etc. But of course, it was not to be. One friend of my mine blames the Russians for this. Whatever the explanation, these horrible months in Ukraine seem all the worse because we had a glimpse of what might have been. 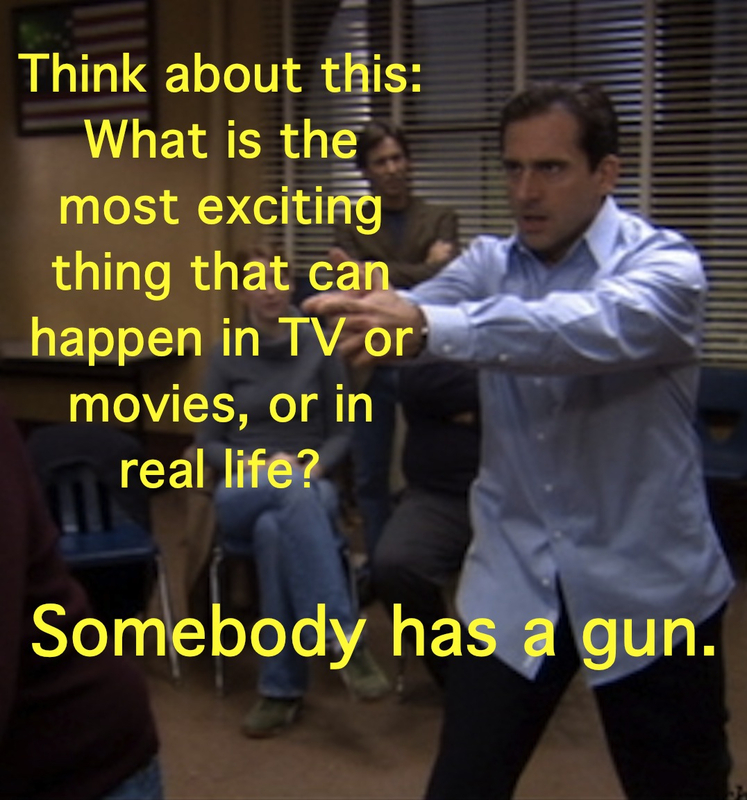 You can’t argue with Michael Scott. Here follows the text of an email that John Judge (University of Dayton ’69, died last week — see post below) sent to me a few years ago. I see nothing wrong with introducing Catholics to scripture and the clear position taken by Christ, whom they claim to worship and emulate, regarding violence and peace. It’s one of the few areas where a quote cannot be taken out of context, because love and peace were the true religion of Christ. Religions have aligned themselves with the state and state-sponsored violence for most of history, and their false teachings have been used as the excuse for wars and crusades and inquisitions. I once suggested that UD change its motto from Pro Deo et Patria to Pro Patria et Deo, since that was clearly its real ordering of priorities. People who invoke Christ and the Bible to justify hatred, prejudice and war are perverting the whole message that Christ preached. Those who claim to follow Christ must constantly be reminded what he said and did and where he stood on violence and hate as well as love and peace. “Those who live by the sword will die by the sword.” “Those who say they love God but not their neighbor are lying.” Let there be “no more of that” as you quote. My friend John Judge died last week. He lived in Washington, DC and, like me, was a graduate of the University of Dayton. He was 66. He suffered a stroke in January, and died on the day that he was moved out of a hospital and into a rehabilitation center. I was introduced to John by another University of Dayton (UD) alum who knew that I was publicly raising questions about the military contracting at UD. UD is a Catholic university which, among other things, has taken huge government contracts to maintain the Minuteman III nuclear missile system. Catholic teaching condemns nuclear weapons, so I have pointed out the contradiction for some years. John had beaten me to the point by a couple decades; he was instrumental, for one thing, in ending mandatory ROTC membership at UD back when he was a student there. In the 1960s, all male students at UD had been required to join the ROTC, until John and others lobbied to end the practice during the Vietnam War. Judge was also a co-founder of CHOICES, an organization engaged since 1985 in providing information to D.C.-area high school students about the negative aspects of, and alternatives to, military service. He had also worked with several service members who had become conscientious objectors while in the military; I heard several of them thank him at his annual birthday dinners. More on those in a moment. John was also, safe to say, a conspiracy theorist. He believed that the shooting of Ronald Reagan in the 1980s was an assassination attempt by, in a nutshell, the military-industrial complex. He believed that there were U.S. government ties to the Guyana massacre of Jim Jones’s followers, whenever that was — 1978? He had many other similar ideas. I did not agree with them, and it made some of our conversations uncomfortable. But still, John was the one person — the one single person, ever — who would call me out of the blue to recommend things like a peace book that he thought I would like, or an article about the latest weapons contract at UD. John threw himself a huge birthday party every December in D.C., inviting, apparently, everyone he knew. Between 20 and 50 people would be there. I went most years. I made it to his final party, this past December, and obviously I am glad I did. The world and the universe get stranger by the moment. Luckily my birthday falls before the alleged Mayan prophecy of the end of the world, so either way I can eat, dance, sing and be merry in the face of lots less work to do if it happens. I’d rather hang around with all of you a bit longer, though. Thanks for all you have been to me and the support you have given that makes my life possible. We could even have a mini-roast, and tell the worst and wildest John Judge stories we can remember! I know a few! Please come if you can, and either way have a wonderful holiday season and a good new year. So anyway, everyone in Heaven, you are on notice — if anyone is being neglected outside those pearly gates, John is going to raise questions about it.